For iOS Device：Download "PrinterV1.0" at "APP Store"
Print Parameters: Support to download trademark, support bar-code print. AC Input: 100 ~ 240V 50/60Hz 0.5A max. Remove the battery power block sticker before you use it. Speed =<90mm/sec, 203dpi resolution, high speed, clear printing & low noise. With auto sleep, auto awake, power saving to prolong service time, standby time up to 2-3 days. It supports 58mm width thermal paper printing, max. printing width 40mm, with 100km reliability printing life. Mini thermal printer, no need for ribbons ink cartridge, low operating cost.With lighting indicator showing working condition, easy to operate.Mini size & lightweight, easy to maintain, portable to carry. 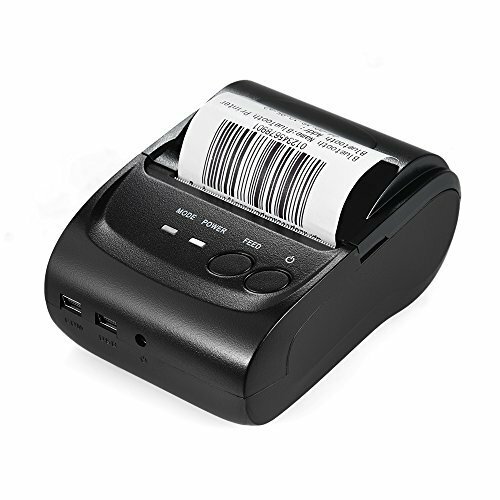 POS-5802DD portable thermal printer is widely used in fields like office, logistic system, taxi ticket, restaurant, online payment information printing.Ideal for receipt, bill, ticket printing.